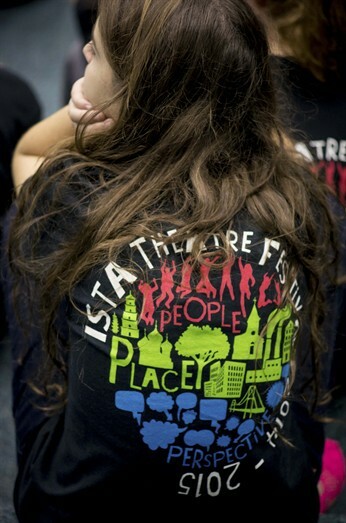 One of the most exciting things about the Drama Department is its membership of ISTA. A Middle School Festival at Shanghai American School, Pudong (3rd to 7th November 2016) – this will be open to Years 6 to 9 and is likely to cost in the region of HK$7500-8000 all-inclusive, depending on final flight costs. A High School Festival at Renaissance College, Hong Kong (17th to 19th May 2017) – this will be open to Years 9 to 13 and is likely to cost in the region of HK$2500-3000 (non-residential). These festivals will be of great interest and benefit to a wide range of our students: all that is required is an interest in Drama and/or other performing arts. The nature of the festivals, which include collaborative work, cultural exchange and a lot of fun, means that those who attend will learn a huge amount – attending such events is often an extremely powerful and transformative experience. Even more exciting is the fact that this year we will also be taking some students to Shanghai who are particularly interested in the production side of theatre, whether this be stage design, lighting, sound or just a general interest in production support. Please note that a letter for the festival in Shanghai will be sent out very early next term, once flight costs have been confirmed. The deadline for signing up for this festival is likely to be 5th September, so you will need to act quickly if you want to attend. No doubt demand will be high after our students’ past experiences in Penang, Manila and Bangkok and after the success of the recent Prep School Production: don’t miss out! This is very exciting: the ISTA Performing Arts Academy in Shanghai are offering a Summer Academy, open to any student aged 11 to 18. Unfortunately the first course clashes with our last week of term, but the second course falls in the first week of the holidays. We have already enrolled students aged 11-18 from several international schools from Beijing and Shanghai and are ready to welcome students from all over Asia! This promises to be a truly unforgettable learning experience – DON’T MISS OUT! Find out more on our website now! www.ista-shanghai.com. This would be a great way to start the Summer Holidays! The final day of the festival was an extremely busy one: each ensemble worked on putting the final touches to their performance for the afternoon’s public sharing, cycling in and out of the performance venue and taking the time to ensure that all students were clear as to their roles. Some new work was generated, but for the most part it was a case of developing and clarifying which pieces of the previous days’ work would be included in each ensemble’s showcase. The performances at these festivals are designed simply to give the audience a snapshot of some of the work that has been created and some of the ideas that have been explored during the festival as a whole. The performance took place in the late afternoon, with many of the host families coming along to watch, along with the visiting teachers and members of the host school community. After that, it was time for farewells and one last evening in host families before we flew back the next day. Some photos of the final sharing will be posted in due course, along with the students’ reflections on the festival experience. In the meantime, here are some images of work in progress. On the second day of the festival, the participants travelled to Georgetown to explore the local street art. As we walked around the old town, the students carried out various research tasks set by their ensemble leaders. The afternoon was spent back at school in ensemble groups. It was a frenetic afternoon with lots of ideas being generated and played with: an astounding amount of material was created, some of which will be used in the final sharing that ends the festival. An important part of the ISTA experience is working as a full group. In the video below, ISTA artist Matt Baker leads the students as they learn part of a song that has been composed around the theme of the festival. And here are a few images from Day 2. The ISTA Festival is entering its third and final day and the buzz around the School has been amazing. If you are planning on coming to the performance this evening, please note that it will begin at 5.45pm. Please therefore make sure you are in the Sports Hall by 5.35pm. It’s a cold and windy day, so you may want to bring an extra layer as some of the performance will take place outside! The programmes have been printed. The T-shirts have been delivered. And today the artists checked into the Gold Coast Hotel. Those of us who are involved in the organisation of an event like this week’s ISTA Festival are so closely bound up with it that we sometimes forget that many people may not be aware of what is happening. 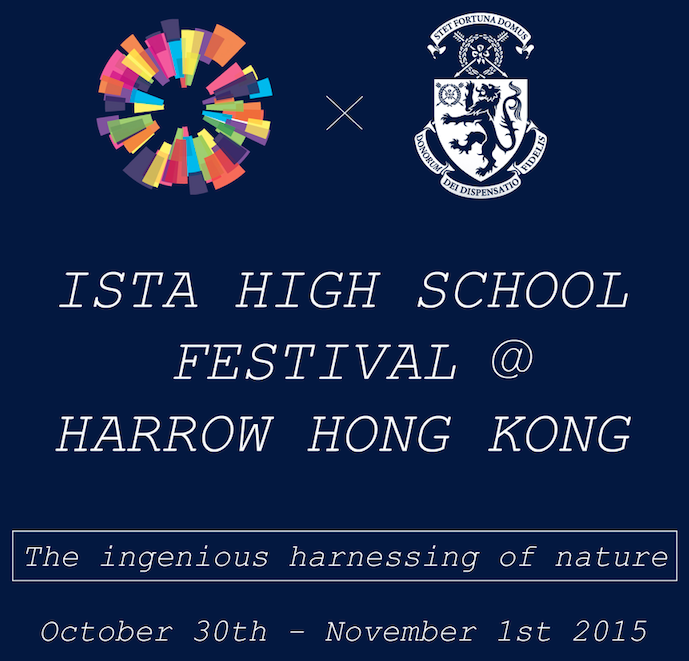 And so the purpose of this post is to shed some clarity on what an ISTA Festival is. ISTA believes that the future of our world depends on confident, internationally minded, collaborative and culturally literate young people who are empowered to engage with and change the world responsibly. We believe that this is achieved through the ISTA experience. Educators play a key role in the fulfilment of our mission. We therefore offer educators worldwide the opportunity to come together to develop themselves, their pedagogy and their skills, equipping and empowering them to bring about this change through theatre. ISTA brings together young people, artists and teachers from different countries in different settings to experience, create and learn about theatre. We passionately value diversity and collaboration, celebration and play, friendship and collegiality. 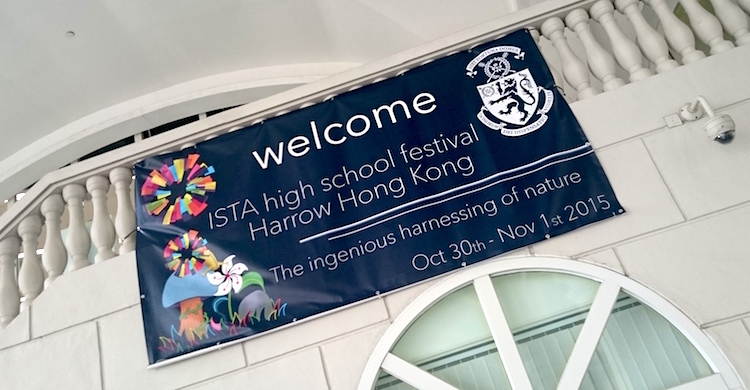 Harrow Hong Kong has been a member of ISTA since 2013 and since that time we have attended three ISTA Festivals: Middle School Festivals in Bangkok and Manila, as well as a High School Festival here in Hong Kong. We have also been fortunate to invite two ISTA artists-in-residence into school to work with a wide range of students and staff. And now it’s our turn to host a festival. This means that 90 students, plus 15 teachers, from other international schools in Hong Kong, Thailand, Korea and Turkey will be visiting Harrow Hong Kong. This means that 8 ISTA artists will work with those students for three days exploring the festival theme, ‘The ingenious harnessing of nature’. This means that 21 of our students will act as an Event Management Team, taking on the leadership of some of the administration of the festival. This means that 31 families will open their doors to host students from schools overseas. This means that the School will be taken over by a whirlwind of creative and theatrical endeavours as the festival participants work through their understanding of the theme, inspired by a visit to the dam that holds back the waters of the Tai Lam Chung Reservoir. Tai Lam Country Park is a beautiful national park in the New Territories of Hong Kong. Its dam and reservoirs serve the enormous population of this bustling and vibrant city. Taking the harnessing of natural resources as a starting point, we will look to explore our relationship with the environment. How do we live in harmony with nature in ways that support our survival and progress as a species? What happens when the two are in conflict? The festival will allow students to learn all sorts of new skills, while working alongside like-minded young people from a range of backgrounds. It culminates in a final ‘performance’, during which the students share some of their learning during the previous three days. We will be making occasional posts here over the weekend, and a full report will go onto the school website in due course. In the meantime…let the festival commence! A sneak preview of the publicity materials, designed by Irene Kim (Y12 Ward).